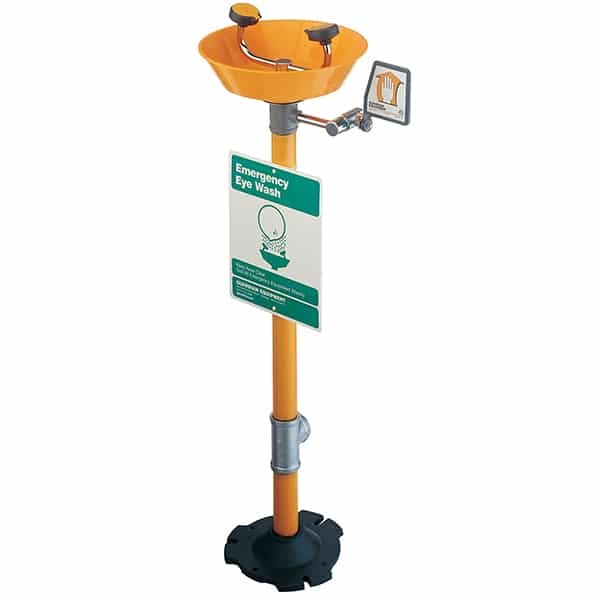 Application: Free standing, pedestal mounted eye/face wash. Two large FS-Plus™ spray-type outlet heads deliver a flood of water for rinsing eyes and face. Bowl: 298cm diameter orange ABS plastic. Valve: 1\2” IPS PVC-coated brass stay-open ball valve. Valve is US-made with chrome plated brass ball and PTFE seals. Pipe and Fittings: Schedule 40 galvanized steel. Furnished with orange polyethylene pipe covers for high visibility and corrosion resistance. Orange powder coated finish on pipe and fittings. Waste: 1-1/4” NPT female outlet. AutoFlow™ eyewash for mounting on counter.